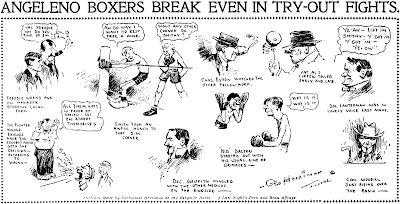 Wednesday, October 16 1907 -- Herriman attends an amateur boxing soiree at someplace called the beanery in Naud Junction. Saturday, October 19, 1907 -- President Roosevelt is in Louisiana on a hunting expedition, trailed by a battalion of reporters and photographers. Reports from camp are less than complimentary to the president who it is claimed merely waited around camp for a group of local trackers and flushers to round up a black bear for him to shoot. This story echoes the more famous incident of 1902 that gave rise to the Teddy bear. 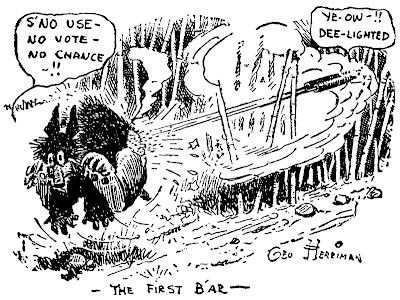 In that case the bear was supposedly tied to a tree for Roosevelt to blast; when he called the situation unsportsmanlike, Clifford Berryman drew an editorial cartoon of the president's 'act of mercy' (the bear was shot anyway), setting the wheels in motion for the introduction of the soon-famous children's plaything. Obscurity of (Another) Day: How Would You Like to be John? We covered this obscurity on the blog waaaaay back on August 30 2007. Cole Johnson sent me some great scans of the strip so we'll take a second look. 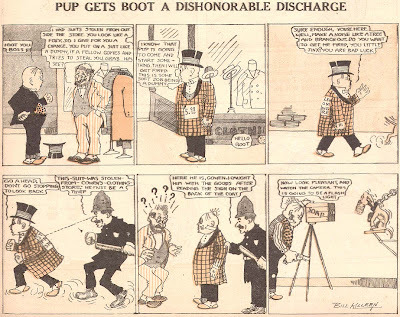 You know what always bugs me about these turn-of-the-20th century comics? When what is said in the word balloon on the left is a response to what is said in the word balloon on the right. It doesn't seems to have occured to cartoonists back then to either change the positions of the characters or their balloons. The balloons are a little annoying, but I appreciate the artwork. Very good IMO. In a bid for more pre-date sales, the New York Sunday News will add eight extra comic pages Sept. 17 for circulation outside the metropolitan area, Executive Editor Richard W. Clarke disclosed. The move will provide a minimum of a 24-page comic section for the country edition. 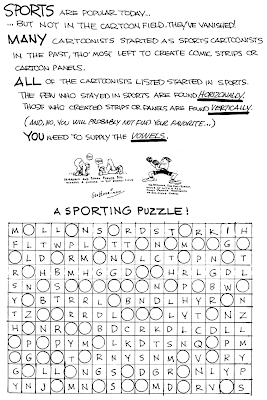 The additional pages will include four Chicago Tribune-New York News Syndicate strips: "Timmy," by Howard Sparber; "Aggie Mack" by Hal Rasmusson; "Texas Slim" by Ferd Johnson; and "Harold Teen" by Carl Ed. The News had dropped "Harold Teen' 'to make room for "Hopalong Cassidy," Los Angeles Mirror Enterprises comic. Two pages are being drawn especially for the expanded section: "Laughing Matter" by Salo, who does the daily panel for the syndicate; and "Rufus," new dog page by Jeff Keate. SOUTH BEND—More than 2,000 youngsters greeted Humphrey Pennyworth, "Joe Palooka's" pal when he visited South Bend, Ind., under the auspices of the South Bend Tribune. Pennyworth, who is on a good-will tour sponsored by Lions International, came to town riding his Humphreymobile and dressed exactly like cartoonist Ham Fisher's famous character. Pennyworth had no formal program. After his public appearance at one of the city's parks he visited two crippled children's homes and the children's tuberculosis hospital. Pennyworth is in real life Howard Hector, 26, of Cortland, Ohio. 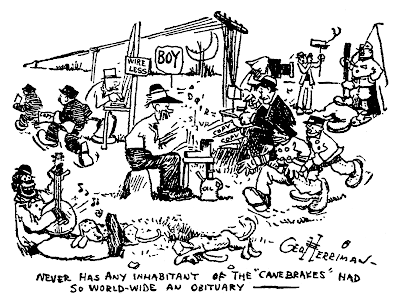 "Travelin' Arkie," daily only comic featuring a homespun hero and Arkansas folk lore, will be released Sept. 4 by Ving Features Syndicate, Sherman Oaks, Calif. Cartoonist, under five-year-contract, is Staff Artist Courtney Alderson of the Sacramento (Calif.) Bee, a native Arkansan. McClatchy Newspapers were among the first customers. A new Sunday comic page "for children only" makes its debut this month when NEA Service launches "Tom Trick, the Fun Detective" with the initial release on Oct. 29. 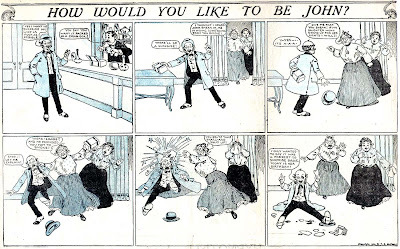 Development of "Tom Trick" came as a result of the many "If I Were Editor" reader surveys conducted by newspapers in recent years. In city after city, readers asked for more features of interest to children of elementary school age. The "Tom Trick" page includes puzzles, cutouts, things to make, coloring 'and art projects, parlor magic and games. While the primary motive is entertainment, there are also a few sugar-coated educational ideas packed away in the drawings. All of the features are tied together with a central character, Tom Trick, who tells the young reader what to do and how to do it. Artist Dale Goss is an educator and former newspaperman. Buckley, the star of AP News-Features' gag panel "Hit N' Run" is going to war starting Oct. 2. The panel, in one and two column sizes, will carry the title "Slice of Ham." Cartoonist Joe Cunningham is a former combat photographer and artist for Yank magazine and created Buckley for Yank. William Paul Pim, 65, artist who drew the "Baby Mine" and "Telling Tommy" syndicated features for newspapers and formerly a cartoonist with the Cleveland (O.) Plain Dealer and Birmingham, Ala., newspapers, July 26 1950, in Birmingham. Frank J. Finch, 71, for many years a cartoonist for the Denver (Colo.) Post over the signature of Doc Bird Finch, September 1 1950. Gene Fowler in SKYLINE recalls when Damon Runyon and Doc Bird Finch "greeted" kids as Santa and his bird assistant in a Denver Post promotion. Santa Runyon had knocked a few back and Finch snuck a bottle of rye inside the beak of his costume. According to Fowler, "it is said that several of the children became atheists that day"! Like Beetle Bailey's army that never went to war, the Badge Guys police force never seemed to do any serious police work. They did, however, have a lot of time to ridicule a feminist female cop, while oddly enough, being progressive enough to feature a black character. Marketed under the tagline "Badge Guys -- it's not a cop-out, it's a cop-in! ", the strip was intended to humanize police officers in an era when their PR was at a pretty low ebb. The strip was added to the NEA syndicate roster on August 30 1971 after a test run in the Detroit News and Akron Beacon-Journal (can anyone supply running dates for the test run?). Art was contributed by Charles Bowen, who in the mid-60s had co-created Hagen, Fagin and O'Toole, another obscurity we'll cover someday, and who was working as an art director for an ad agency by the 1970s. The writer was Ted Schwarz. This is his only comic strip credit, but he is a a very successful author, having written over 100 books under his own name, not counting many ghostwriting assignments. His splashiest success came under an "as told to" byline on car magnate John DeLorean's autobiography. The Badge Guys was canceled on July 28 1973. In an unusually candid statement, NEA announced that they fired the Badge Guys when the feature finished dead last in a poll of their newspaper clients. Charles Bowen was my father in law. We have many "letters" drawn by him and sent to his gran kids over the years. He had a particularly bright outlook on life reflected in his strips and sketches. The Denver Rocky Mountain News picked it up in '72 and ran it for a relatively short time. By the 1910s what had once been a generally high quality comic section in the Philadelphia North American was running out of gas. I guess they figured they could get away with low-rent material since the Inquirer and Press had pretty tired line-ups, too. 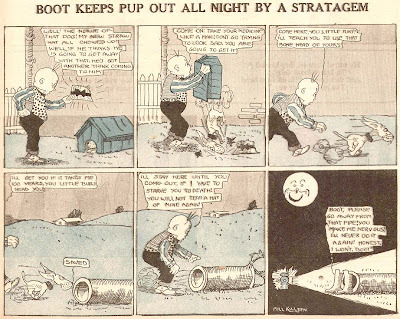 One of the North American's saddest entries was Boot's Pup by Bill Killeen. Killeen, who has no other credits that I can dig up, gave us amateur hour art and a rather unsettling plot concerning an unbalanced fruitcake bent on torturing his dog. Another weird little conceit was that although Boot appeared to be an old man he seemed really well-versed in the latest hip slang. Shrug. Killeen probably didn't think all that much of his own creation because although he produced it for an entire year (February 23 1913 - February 15 1914) he never got around to naming it. I call it Boot's Pup but in reality there never was a running title. Tip of the hat to Cole Johnson for the scans. Thanks Cole! Jim, you're driving me crazy with these games. I still got a third of the circles still blank. But I work on it some more before you give the answers next week. I found easier going once I printed the page out on a sheet of paper.